Dr. David Hulett, a project risk expert and thought leader, supported the newly introduced integrated cost and schedule risk analysis tool Acumen Risk calling it "an elegant product." Dr. Hulett published a technical paper on schedule and cost risk analysis using Acumen Risk. A schedule risk exposure report in Acumen Risk. 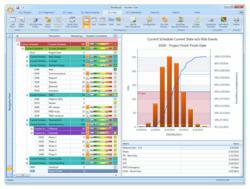 Acumen risk is a robust tool that, at the same time, simplifies schedule risk analysis. In a new technical paper, Dr. David Hulett, a recognized authority on project risk management and scheduling standards, supported using the new-to-market Acumen Risk™ schedule risk analysis tool for project risk analysis and modeling. Dr. Hulett evaluated the tool and submitted the paper to publish on the Acumen website and distribute to interested project management organizations and professionals. Dr. Hulett has authored several publications on risk management including two books, Practical Schedule Risk Analysis and Integrated Cost-Schedule Risk Analysis (Gower 2009, 2011). He was the lead for the risk management chapter in the 2000 and 3rd editions of the Guide to the Project Management Body of Knowledge (PMBOK® Guide) published by the global organization Project Management Institute (PMI) and a recommended practice for integrated cost and schedule risk analysis published in 2011 by the Association for the Advancement of Cost Engineering (AACEI). Having worked with numerous project management software applications, Dr. Hulett is well versed in the relative strengths of commercial software. Acumen Risk is an integrated cost and schedule risk analysis and risk register software that eliminates the statistical and logical complexities of traditional risk tools while still offering powerful analytics and consistently accurate results. The software joins robust functionality with meaningful reports showing schedule and cost risk drivers, project risk exposure, and uncertainty inputs. Acumen Risk is based on the Acumen approach to risk analysis that has been implemented in projects totaling over $300B and has a forecast accuracy margin of just days. The white paper written by Dr. Hulett is available for download here. As a project management solutions company, Acumen is the indisputable best at providing insight into project challenges and using analytics to effectively overcome them, as well as aligning successful performance with corporate vision. Acumen was born from the acknowledged need for improved project performance, insight, and vision, through analytics with respect to both timeline and bottom line. Hulett & Associates, LCC is a leading consulting firm specializing in project risk management, project schedule assessment, project auditing, and more. The firm also provides proprietary training in project risk analysis and project scheduling. Headed by Dr. David Hulett, H&A services an international client list in industries including government, oil and gas, aerospace and defense, construction, pharmaceutical development, and transportation.